i name="DatabaseLogID" column_id="1" user_type_id="56" is_nullable="0" is_identity="1"
i name="PostTime" column_id="2" user_type_id="61" is_nullable="0" is_identity="0"
i name="DatabaseUser" column_id="3" user_type_id="256" is_nullable="0" is_identity="0"
i name="Event" column_id="4" user_type_id="256" is_nullable="0" is_identity="0"
i name="Schema" column_id="5" user_type_id="256" is_nullable="1" is_identity="0"
i name="Object" column_id="6" user_type_id="256" is_nullable="1" is_identity="0"
i name="TSQL" column_id="7" user_type_id="231" is_nullable="0" is_identity="0"
i name="XmlEvent" column_id="8" user_type_id="241" is_nullable="0" is_identity="0"
i name="BusinessEntityID" column_id="1" user_type_id="56" is_nullable="0" is_identity="0"
i name="NationalIDNumber" column_id="2" user_type_id="231" is_nullable="0" is_identity="0"
i name="LoginID" column_id="3" user_type_id="231" is_nullable="0" is_identity="0"
i name="OrganizationNode" column_id="4" user_type_id="128" is_nullable="1" is_identity="0"
i name="OrganizationLevel" column_id="5" user_type_id="52" is_nullable="1" is_identity="0"
i name="JobTitle" column_id="6" user_type_id="231" is_nullable="0" is_identity="0"
i name="BirthDate" column_id="7" user_type_id="40" is_nullable="0" is_identity="0"
(495 row(s) affected) Table 'Worktable'. Scan count 0, logical reads 20788, ..., lob logical reads 7817781, ..., lob read-ahead reads 1022368. SQL Server Execution Times: CPU time = 53688 ms, elapsed time = 53911 ms.
Table 'Worktable'. Scan count 0, logical reads 20788, ..., lob logical reads 7817781, ..., lob read-ahead reads 1022368. CPU time = 53688 ms, elapsed time = 53911 ms.
(1 row(s) affected) Table 'Worktable'. Scan count 0, logical reads 7, ..., lob logical reads 2691, ..., lob read-ahead reads 344. SQL Server Execution Times: CPU time = 15 ms, elapsed time = 51 ms. (495 row(s) affected) SQL Server Execution Times: CPU time = 47 ms, elapsed time = 125 ms.
Table 'Worktable'. Scan count 0, logical reads 7, ..., lob logical reads 2691, ..., lob read-ahead reads 344. CPU time = 15 ms, elapsed time = 51 ms.
CPU time = 47 ms, elapsed time = 125 ms.
As it turned out, the problem lies in the conversion of types. Thus, you need to pass a parameter to the nodes function in the XML type. Consider a situation when we need to filter results while parsing. Remember that SQL Server does not optimize function calls to work with XML. To demonstrate this, I execute the following query. The value function will be executed twice. (404 row(s) affected) SQL Server Execution Times: CPU time = 116 ms, elapsed time = 120 ms.
CPU time = 116 ms, elapsed time = 120 ms.
(404 row(s) affected) SQL Server Execution Times: CPU time = 62 ms, elapsed time = 74 ms.
CPU time = 62 ms, elapsed time = 74 ms.
(404 row(s) affected) SQL Server Execution Times: CPU time = 110 ms, elapsed time = 119 ms.
CPU time = 110 ms, elapsed time = 119 ms. There is no significant benefit. Although QueryCost says it all. As we can see, the third variant is the most effective… This is an additional argument to use QueryCost that is only internal assessment. (5273 row(s) affected) SQL Server Execution Times: CPU time = 66578 ms, elapsed time = 66714 ms.
CPU time = 66578 ms, elapsed time = 66714 ms.
Why it happens? 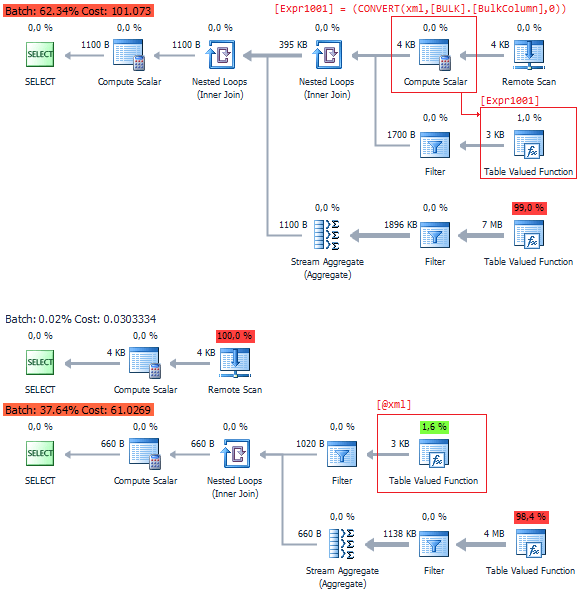 SQL Server has some problems with reading the parent nodes from child nodes. (5273 row(s) affected) SQL Server Execution Times: CPU time = 156 ms, elapsed time = 184 ms.
CPU time = 156 ms, elapsed time = 184 ms.
(5273 row(s) affected) SQL Server Execution Times: CPU time = 47 ms, elapsed time = 137 ms.
CPU time = 47 ms, elapsed time = 137 ms.
You don’t have to think that OPENXML has clear advantages over XQuery. There are enough issues with OPENXML. For instance, if you forget to call sp_xml_removedocument, it may result in memory leaks. All tests were performed on SQL Server 2012 SP3 (11.00.6020). Execution plans were taken with help of dbForge Studio.